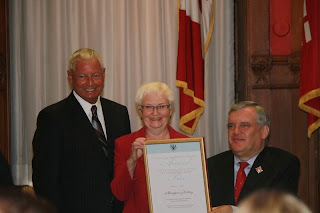 Joan Berndt of Toronto is an active volunteer in various organizations. As a board member of SAINTS - Student Assistance in North Toronto for Seniors - she has helped build bridges between seniors and secondary school students so they can gain mutual respect and understanding. 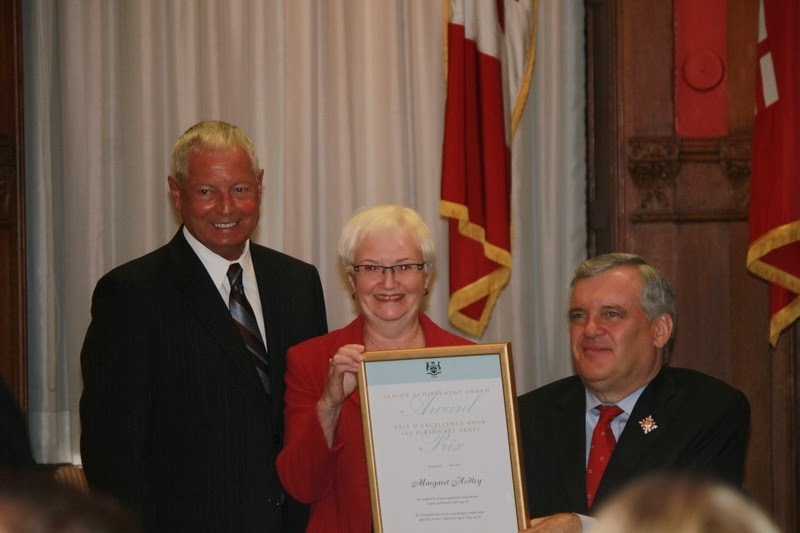 She also has volunteered for the Children's Aid Society of Toronto, Washago Community Centre, and POINT - People and Organizations in North Toronto. Maria Bilyk of Thunder Bay is a leader in her community who has volunteered at St. Joseph's hospital for 65 years. She is an active member of the Thunder Bay Regional Health Sciences Centre Volunteer Association, and helped to establish the Helping Hands auxiliary of Pioneer Ridge Home for the Aged. Marlene Brant Castellano of Tyendinaga Territory is a respected Mohawk elder, retired professor and researcher of Native Studies. She is dedicated to First Nation children's well-being through initiatives such as the Child and Family Caring Society, and is an advocate for Mohawk and First Nations traditions and culture. Alexander Broski of Atikokan is a committed volunteer who has provided leadership in a range of projects with the Lions Club for 56 years. He is a founding member of Atikokan's Sports Days, which he has helped organize for 28 years, and has chaired the local Christmas Cheer fund for three decades. Carmel Chartrand of Pembroke is a vocal advocate for local Francophone education. An active volunteer at the Centre Scolaire Catholique Jeanne-Lajoie, she does everything to make sure the school remains strong and vibrant -- from making breakfast for the students to assisting teachers with a myriad of projects. Don Downey of Eganville is a respected former teacher and leader who mobilizes his community to start new projects. He convinced community members to create a ski program for local school children and went on to operate it for 25 years. For more than 49 years, he has been a remarkable contributor to the Rotary Club. Norma Friest of Creemore is a volunteer who is keeping music alive in the Nottawasaga and Creemore Public Schools' classrooms. She manages the instrumental music program, encourages afterschool activities among students, and promotes the importance of accepting people with different abilities through the Teachable Project. Margaret Hedley of Guelph is a retired dietitian who promotes healthy eating for older adults. She helped to develop the Guelph Wellington Seniors Association's "Feeling Better Eat Well" program, and is a facilitator at the association's diabetes support group. She also is the board chair for the Guelph Community Health Centre. Janet Loney of Emo is a dedicated community leader who helps to support the lives of disadvantaged people in her Northern Ontario community. She created Emo's Meals on Wheels program, and helped establish the Assisted Living Building Committee, which helps seniors to stay in their home community when they require assistance with their everyday needs. Elizabeth Macadam of Shreiber is a loyal volunteer who has been an active member of the Ladies Auxiliary to the Royal Canadian Legion for more than 65 years. She has served as a board member of the McCausland Hospital, helping implement many initiatives, and as former president of the Chimo Senior Centre, enriching the lives of local seniors. Lloyd Michon of Thunder Bay is a veteran of the Korean War who advocates for urban Aboriginal people. He was instrumental in creating the Thunderbird Friendship Centre in 1972, and is its current president. He represents his area at gatherings of the Ontario Federation of Indian Friendship Centres, is the Director of the North of Superior Counselling Programs Board, and a member of the Metis Nation of Ontario and the Thunder Bay Multicultural Association. Joe Neuhold of McArthurs Mills is known in his community as "The Elk Man". He is custodian and caregiver to a herd of 40 to 50 elk that were reintroduced to the McArthurs Mills area where they are now protected by the Rocky Mountain Elk Foundation. He brings joy to visitors by hosting tour groups, students and tourists. The late Annie Parsons of Winchester was a remarkable volunteer with the Dundas Manor Nursing Home. Known for her hand-made crafts, she made and gave away name tags, book marks and decorations for the nursing home's dining room tables, touching the lives of each resident and staff member. Robert Saracino of Port Colborne is a public figure well respected in the Niagara region. As former mayor, municipal councillor and Niagara Region councillor, he helped improve the lives of seniors, veterans and people with disabilities. He successfully lobbied for a local transit system for the disabled, and through his efforts the Northland Pointe, a new seniors' residential complex was built in Port Colborne. Simcha Simchovitch of Toronto is a Polish Holocaust survivor who uses his love for languages to translate works of poetry from Yiddish into English. A retired teacher and curator at the Beth Tzedec Museum, he volunteers using his talent at translation to work on exhibitions. He moved to Canada with his family in 1949, and writes about his experiences. He has 18 pieces of his writing published, including seven books of poems. Kenneth Stanton of Windsor is a longstanding volunteer dedicated to preserving and promoting history through the North American Black Historical Museum in Amherstberg. He has developed an educational program at the museum that draws hundreds of students and other visitors every year. Gib Turner and Marian Turner of Kearney have devoted themselves to volunteer activities in their home community. The couple is well known at the Kearney Seniors' Centre, where they helped establish an accessible pavilion and skating rink to help local residents. Rochelle Waxman of Hamilton has been an integral part of Shalom Village - a Jewish faith-based non-profit organization that provides services for older adults. As a volunteer for 33 years, she has done everything from making welcome baskets, to running Sunday brunches and starting up a highly successful Ladies Auxiliary Tea that has funded many new programs. Frances Wentges of Burlington has been an active volunteer for the Good Shepherd Centre in Burlington. She contributed to the successful establishment of Good Shepherd Square, which follows a health and wellness model to help vulnerable members of the community cope with the crippling impact of poverty and abuse. Terry West of Toronto is a knowledgeable and respected leader who has promoted initiatives for the Don Mills area. As president of his local ratepayers' association, he worked with different levels of government to improve his neighbourhood during the redevelopment of the Don Mills Centre. He volunteers with the Don Mills Community Share Food Bank and Better Living Health and Community Services, which supports peoples' independent living.